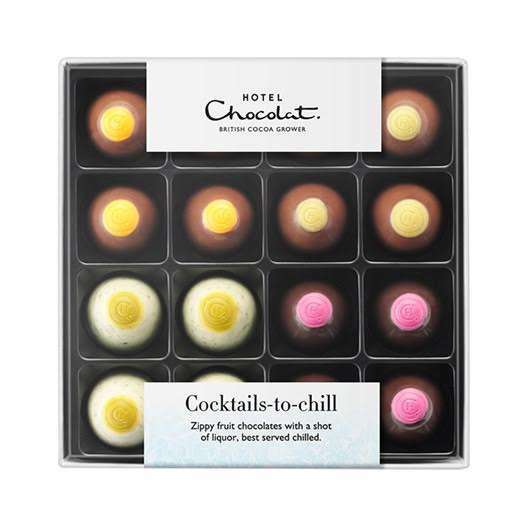 Here’s a great chance to win a box of Hotel Chocolat’s new range of slightly-boozier-than-normal chocolates. The Cocktail Chocolates to Chill box contains sixteen chocolates four Passionfruit Margaritas, four Moscow Mules, four Mojitos, and four Grapefruit Gin & Tonics. These are not the dusty old liqueur chocolates of old … there’s no terrible flood of alcohol as you bite into them, no sickly aftertaste. These chocolates taste fresh and light, the alcoholic content subtle and very well-balanced with the chocolate. The flavours work together well and they most definitely do taste better chilled from the fridge – I checked both ways so you don’t have to. To win, enter your details in the form below, and good luck!